It’s fall! Well, sort of because we had two days of hundred-degree weather. Yeah, I love California. Last week, I started keeping a food journal to keep what I was munching on in check and I apparently do a lot of snacking… I’m not overweight or unhealthy by any means. In fact, I’m actually pretty skinny. However, it’s been a goal to get rid of the layer of fat masking the abs that I know I have. I can do it! Mindless eating is an unhealthy habit regardless of your weight or what your health goals are. If it weren’t for my highly active life, I’m sure I’ll have gained a significant amount of weight. Baha. 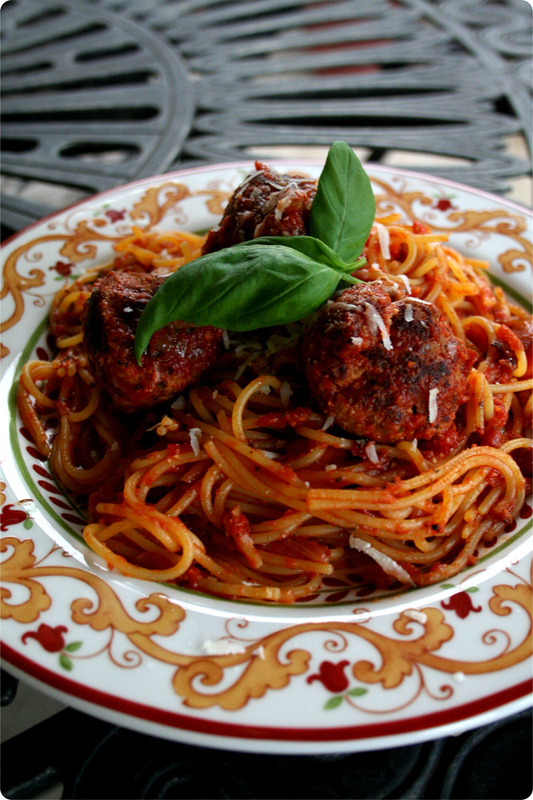 Anyways, every so often I crave a bowl of spaghetti and meatballs. I don’t know why. There’s something about a simple bowl of tomato sauce over pasta that makes me so very happy and satisfied even if spaghetti isn’t really the best thing for you. However, I’ve made this lower in fat and in bad-carbs, and upped the veggies and lean-protein. And, seriously, quinoa pasta isn’t like whole-wheat pasta. It has pretty much the same consistency as normal white pasta but is so much better for you (and it’s actually whole-grain). Get it for you, get it for your family and you’ll all benefit. Preheat oven to 350F. In a small skillet, saute the 1/3 c. of onions for the meatballs until glossy and slightly translucent. Add garlic, if using, and saute until fragrant. Transfer into a large mixing bowl and mix together rest of the ingredients with your hands. Shape into about golf-ball size balls and transfer to a baking sheet. Bake for 30 – 40 minutes, turning half-way through, if desired. Meanwhile, in a food processor, take 1/2 – 3/4 of the can, depending on how smooth or chunky you like your sauce, and puree it in a large food processor with parsley (You can add some basil if you like. I didn’t have parsley!) and add dried herbs, slowly. Set aside. Bring a large pot of salted water to a boil and add your pasta. Keep an eye on it! In a large frying pan, saute onions, carrots, and celery in olive oil over medium-high heat, stirring to prevent burning. When onions are soft and translucent, add two cloves of garlic and saute until fragrant, lightly browned and no longer raw. Add your tomato puree and simmer for 10 minutes. Slowly add the rest of the can that was reserved. Place meatballs in sauce and allow them to simmer with the sauce for 4 – 5 minutes to incorporate some flavor. Spoon sauce and meatballs over al dente pasta. YUM YUM! Pasta dishes are my idea of comfort dishes– they’re usually cheesy or herby or tomato-y and are filled with instant carbohydrates waiting to be stored into fat cells until I work them off at the gym. I’m a lone-wolf at the gym but the boyfriend and I are working on my irrational paranoia of seeing people that I know (including him) at the gym derived from probably low-self esteem from freshman-year weight gain, birth control, and an overall decrease in fitness, health, and happiness last year. I love being at the gym: exercising and getting disgustingly sweaty so I need to at least be able to see someone and be fine with it and not let their opinions affect what I do despite whether or not they exist or not. So I’m lucky to have someone to help me out, stay healthy, busy, and to grow from. Love, love, love it. Since I’m going to be heading to the gym and today, being the worse day, schedule-wise, to cook, I decided to go with a pasta dish. High in carbohydrates (~40g, 16 – 20% DV) from the gnocchi (in moderation, pasta is great!) and only about 355 – 400 calories per ~ 2 cup serving, this is a great energy source, simple, and is incredibly F L E X I B L E. I love pesto with fresh shrimp and blanched asparagus. Usually, I would make my own basil-pesto to control sodium levels but store-bought pesto (with olive oil) is perfectly fine! I also used shredded rotisserie chicken made with NO SALT and pre-made vacuum-packed gnocchi. I’m what you call a TIME-SAVER. In a small food processor, blend all ingredients in Basil-Pesto Sauce until smooth. Season as needed. Meanwhile, in a small bowl, soak sun-dried tomatoes in simmering water and a couple tablespoons of balsamic vinegar for 4-5 minutes, drain, and chop into slivers or bite-sized pieces. Bring medium pot of salted water to a rolling boil and cook gnocchi until each potato dumpling rises. Remove, drain, and keep warm. Reserve a little cooking water. In a large frying pan, heat olive oil. Sweat chopped shallots then add garlic and sun-dried tomatoes. Saute until garlic is fragrant, but not burnt. Add shredded chicken, basil-pesto sauce, gnocchi, and a couple tablespoons of reserved pasta water. Cook until everything is warmed through. 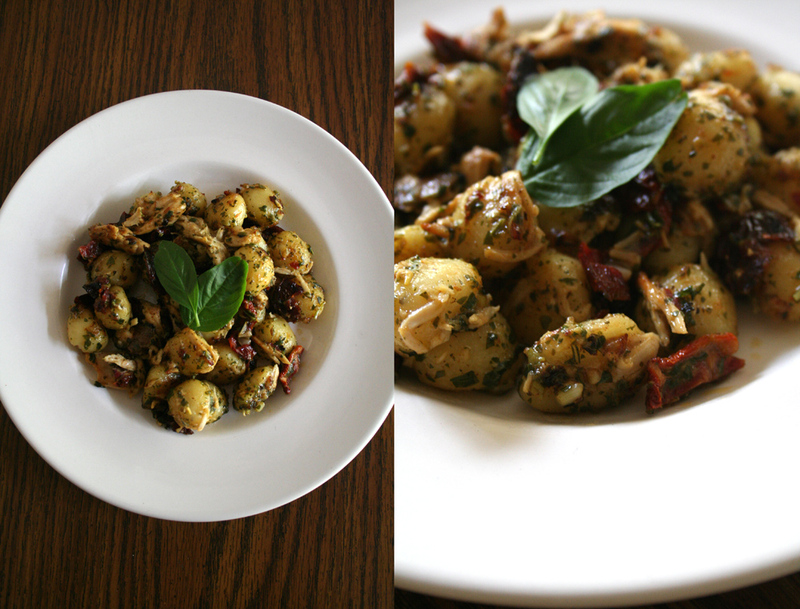 If desired, until gnocchi shows a little caramelization. Season with pepper, if needed. Spoon 2 cup serving sizes into bowls and garnish with fresh basil and shredded cheese, if desired.